In the App Store has always been some applications that stop working or did incorrectly if they were pirated detected and the user never paid for their use. After Tweetbot began his particular fight against those who pirated the social network client, leaving them in evidence before all the world, now other developers have joined to combat illegal use of original technical applications. 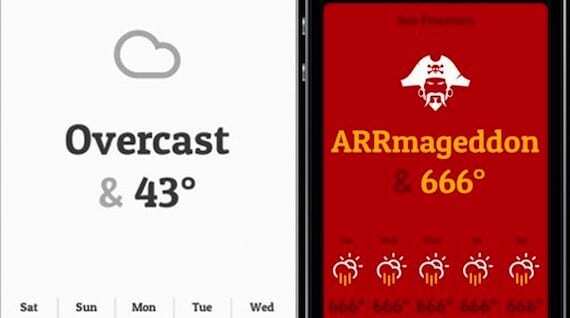 For example, the application Conditions reached the App Store to provide weather forecasts through a minimalist interface. It costs only 0.79 euros but still, there are people who pirated despite that runs on devices that rarely below 400 euros and are nourished precisely that, of applications. What happens if the application pirateamos Conditions? The picture illustrates perfectly reflects the post: the user will weather forecast and instead, the application will show obvious signs that has been hacked into believing that this is the Apocalypse. It seems perfect that serious developers implement these solutions to gain sales, after all, this is a job and as such, must be paid. Article Other developers are starting to use anti-piracy methods in their apps was originally published in News iPhone .